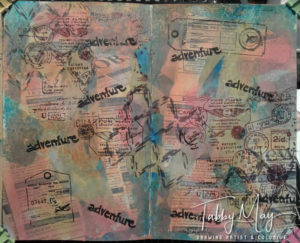 Home » Art Journaling » Adventure… come along on a mixed media trip! Fall is here, summer’s over. Thankfully the weather is still nice where we live in Southern Spain. Like today, with a blue sky and 26 degrees Celcius on the thermometer. Just like the previous summers here, it was nearly unbearable to do something creative in my studio. On the real warm summerdays temperatures rise easily to 35 °C and I don’t have an aircon there. But since the temperature is lowering and the nights are way cooler, I’m upstairs in my studio more often. 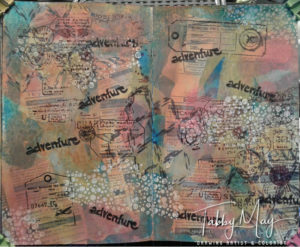 Working on crafting projects and enjoying one creative adventure after another. To start again I thought it would be best to do something not too large. 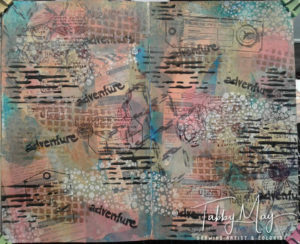 So I took out my A5 Dylusions art journal and I’m actually quite satisfied with the result. First I started with Americana acrylic paint, using the colors Desert Turquoise and Marigold. For this I’ve used a small brayer. Then I added a bit of Amsterdam paint, color Skyblue Light. After that I sprayed a bit of Marabu acrylic spray paint in yellow and blue. When we were having a (delicious I must say) lunch at Beach Club Gali Gali in Fuengirola, I ‘stole’ a piece of paper from underneath my hubby’s club sandwich haha. It looked like a newspaper and was just too nice to throw away. So I wanted to bring it home to use it in my art journal. And voilá, below you can see that I really did use it! 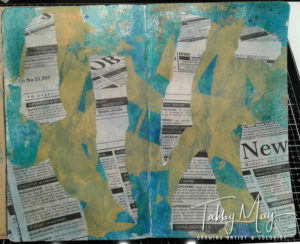 I’ve used Liquitex Matte Gel Medium to glue the ripped pieces on the spread. To give some more color I’ve added some Distress Oxide on top of it, using a blending tool. I just forgot to write down which colors I’ve used. Well, some red, orange and yellow… 🙂 When that was ready I took the Studio Light foam stamp (FoamMM03) from their Mixed Media line and used… ehm… no idea what ink I’ve used. I suspect it was Versaclair Nocturne, since I really like that ink and use it a lot. Once stamping I couldn’t stop, so therefore I’ve got no pictures of all the steps I took. The used stamps are: StampMB15 (the word ‘adventure’) from the Studio Light Bloom line by Miranda van den Bosch/Rainbow Designs, StampMS291 (tickets) and StampMS293 (background stamp) from the Studio Light Memories of Summer line and the crackle stamp WTKCC137 from Stamperia. The latter however was stamped so lightly, with Distress Oxide Antique Linen, that one can barely see it. The next stamping round I did with another stamp from the Bloom line of Studio Light (StampMB11) and for that I took my Unicorn White pigment ink from Hero Arts. After stamping I wanted to add some extras with a stencil. Again the Studio Light Bloom line was my source with the stencil MaskMB06. 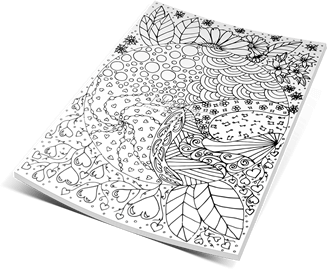 It’s a stencil with a couple of different patterns and I’ve used two of ’em. For one with text-like lines I’ve used black Versaclair ink and the grid pattern I did with Distress Oxide (I think Vintage Photo, forgot to write it down). 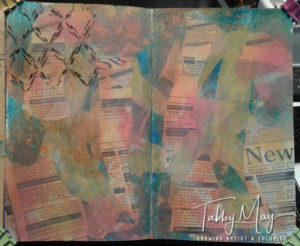 After the Studio Light stencil I’ve also added a couple of dots with a Tim Holtz mini stencil from the latest set 36 (TMHMST036) and a Distress Oxide, color Old Paper. 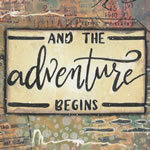 And then I decided that the background was ready for now, so I started picking a couple of nice die cuts. For die cutting I use a Sizzix Big Shot Plus and over the last couple of months I’ve collected a lovely variation in dies. 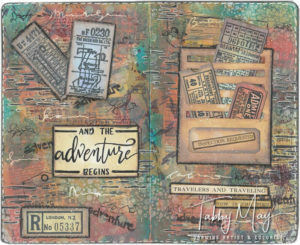 Not too long ago I’ve bought the Sizzix Tim Holtz framelits, Ticket Booth (no. 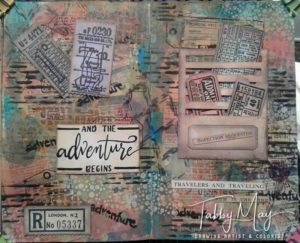 662698) and the matching Sizzix thinlits Stitched Slots, Tim Holtz also (no. 662697). I had seen a video by Gerda van Dijk in which she used these sets and after that I went out looking for them. And you know, one who seeks, shall find 😀 ! 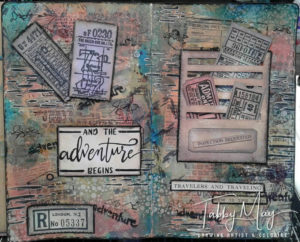 Then I stamped the matching Stampers Anonymous Ticket Booth stamps (CMS337) on the ticket die cuts. When I had colored and glued all die cuts to the page, along with the Idea-ology texts, I outlined them all with a black Stabilo All pencil. And I activated and diluted it with a water brush. To glue the die cuts I’ve used the Dutch Doobadoo Glue pen. To give the spread a more finished look, I’ve added a black border with the black Stabilo All pencil as well. And with a black Uni-Ball pen (Eye UB-157) I’ve also added a dashed line around the edge of the pages and I made some scribbles. So I added white water based Sharpie around the lines that I’d made with the Studio Light Bloom stencil and I’ve done a bit of scribbling in white as well. Since I felt the dashed line wasn’t clearly visible enough, I’ve covered it with the white Sharpie. Lastly I’ve added splatters from the Sharpie all over the spread, using a pair of scissors (‘hitting’ the marker, not too hard!). And when I checked again and looked closely, I felt that it was finished. In the additional photo album to this blog you’ll find all of the above pictures. There you can view them enlarged and as a slideshow as well. Then you’ll best be able to see the build up to the end result. I’ve also added a couple of pictures that are not in this blog, but are well worth viewing. So click here to see the pictures! The next blog will follow shortly. I’ve completed the Summer challenge of hobbyshop ‘de Duif’ (see my earlier blog), but I haven’t posted it yet. So that will be next!